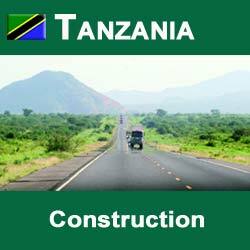 According to a report by the Daily News, the recent focus on increased investments in the Tanzania construction industry has helped to improve the overall performance of the growing sector. In addition, the Daily News report also said that, according to officials the growth of the construction sector has surpassed that of both the mining and tourism sectors and is currently growing between a rate of 12 and 15 percent, which is an increase from the 9 percent growth rate that was recorded last year. To this end, Boniface Muhegi, Registrar for the Contractors Registration Board (CRB), explained that growth in the country’s mining and tourism sectors has slowed as a result of its dependence on foreign sources and the global economic crisis. Until 2007, the mining and tourism sectors were reportedly the fastest growing sectors in the country, recording an average of 8 to 10 percent annual growth. According to the Daily News report, because of the closing of several mining projects and the scaling down of others, the country’s mining sector has recently been less financially active. “After the global financial crisis, [the] mining sector, which is heavily dependent on foreign investment experienced credit crunch,” said Mr. Muhegi in the Daily News report. The construction sector, on the other hand, currently contributes between 6 and 7 percent to the country’s overall Gross Domestic Product. According to the Daily News report, in response to a question concerning to source from which the construction sector was receiving its funding in order to build new multi-storey building complexes in the country’s commercial capital, Mr. Muhegi indicated that local banks were providing the sector with financing. “Local banks, which have not been hit by the credit crunch, are responsible for financing the real estate,” he said. Construction on one of these new building complexes, an investment by the British-based property firm, Actis, has recently just been completed in the central business district of Dar es Salaam and is scheduled to be opened next January. According to Claire Davies, the Actis Communications Manager, space at the 10-storey office block, which is a USD 20 million investment and is located next to Tanzania Development Finance Limited, is almost leased out. “The space is almost fully leased out, but there is still some limited space available,” she said. While the construction of this office space will likely help in an area where limited office space has increasingly becoming a problem, because the Actis building was built in the same location where a four-storey parking block once stood, the problem of limited parking spaces has heightened. Nevertheless, Actis is currently working on a solution to this concern with the construction of an additional parking area near the complex. In addition to this project, the construction sector will also be supporting a project that is being publicized as the country’s tallest building, Uhuru Heights. Construction of the 25-storey building will cost more than USD 50 million upon completion and is a joint venture between Nida Textile Mills and the Indian property giant, Cosmos. Located adjacent to the Uhuru Heights building is the 18-storey Viva Complex, a project that was mutually embarked on by a local private property developer and the Tanzania Red Cross Society.